Growing up, my sister, brother and I would always have certain nights we’d get really excited about! Mainly, Sunday spaghetti and meatballs (The Sopranos night when it was still airing), our birthdays where we picked any meal we wanted, and Friday Night: Pizza Night. As I’ve gotten older, the typically Friday night doesn’t include Pizza anymore, but when it does, I really enjoy making it from scratch! It also helps that I just received a new Pizza Stone be Emile Henry from Crate & Barrel and was excited to use it! I love my pizzas super cheesy with pepperoni and lots of tomato sauce! I found a great recipe on House of Yumm for a No Yeast Pizza Dough that was easy to whip up in about 5 minutes. The best part about it, you more than likely have all of the ingredients already in you cabinet: flour, baking powder, salt, milk & butter. In the time it takes you to make the dough and pop the pizza in the oven, Seamless would’ve just processed your order, it’s that easy! I used a pizza stone which does not require any greasing, but you can also use a baking sheet lined with parchment paper. In a large bowl (I used my Kitchen Aid with the dough hook attachment) combine all the ingredients and mix on low speed until one ball of dough forms. If you don’t have a mixer, you can do this by stirring with spatula, or your hands, until the ball comes together. It’s a bit of extra work, but you’ll have some killer arms! Sprinkle flour onto your rolling pin, on your hands and lightly onto the counter you’re working on. Remove the ball from the bowl and pat down to form a solid ball. Roll the dough into a ball and set onto the prepared baking sheet. Using the rolling pin, roll out the dough to the desired thickness. Average is about 1/4 of an inch, but it’s not a science, it’s your preference. The thicker the dough, the longer the pizza will need to be in the over, but be careful not to make it too think that you end up burning the toppings just to cook the dough! Cover the rolled out dough with tomato sauce leaving about an inch around the edge for the crust. I blend together Rao’s Marinara Sauce with their 4 Cheese Sauce. Bake for 10 – 12 minutes on the bottom shelf of your oven until you see the crust browning and the cheese melting. Your nose is your best tool! When you start to smell the pizza, check it. Remove from the oven and allow to cool and set for roughly 5 minutes. Then, ENJOY! As you can see, it was a success in my house!! I’m going to come right out and be up front here… I don’t like Cheesecake. I know, general statement. I’ve only tried a couple different kinds. Typically, my goal when I don’t like a certain dessert is to find a way to make it so that I do like it. 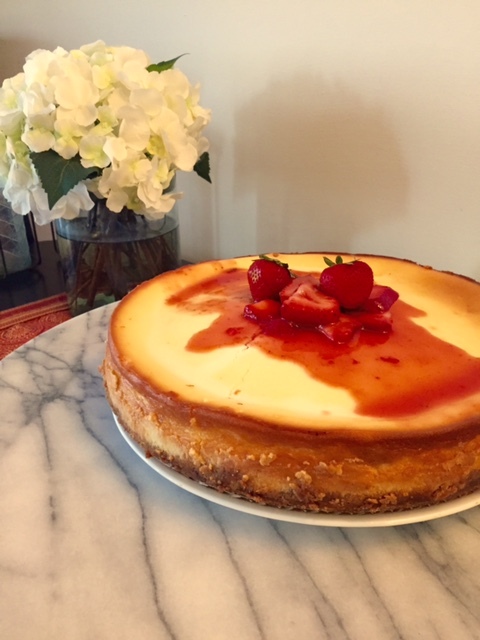 The New York Style Strawberry Cheesecake however, is an exception. You just don’t mess with it, kind of like New Yorkers in general. *Water bath is cooking the cheesecake by placing the spring-form pan inside a roaster/pot of boiling water. it helps to regulate the temperature and protect the cheesecake while it is cooking. The first one I made with no water bath came out burnt on the top, the crust was overcooked and it was slightly uneven. For the water bath method, rather than putting the spring-form pan directly in the pan of water, I placed a pot of water on the rack directly below and the cheesecake came out beautiful! Another trick I found to keep the top smooth: do not use convection bake on the oven, just use regular bake. 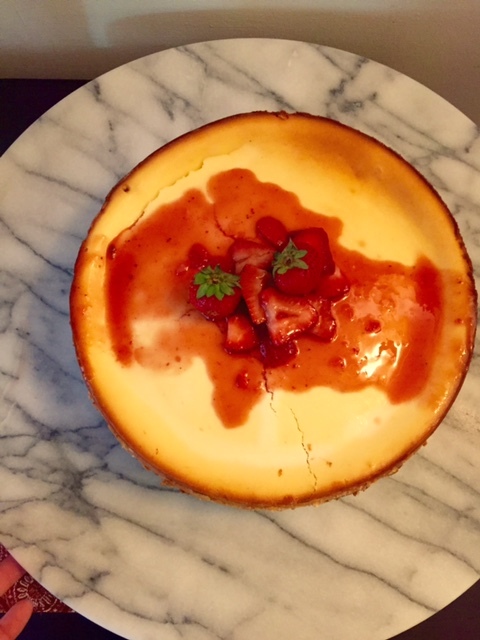 I made this mistake on my first cheesecake as well which was one of the causes of the unevenness. As you work through the recipe there will be some additional tips along the way. Hopefully at the end you’ll have a dreamy and delicious dessert to share! Butter the bottom and sides of your spring form pan and place a fitted piece of parchment paper on the bottom. I used a 10.25-inch Spring-form pan, but you can also use a standard 9-inch. Just make sure the sides of the pan are at least 2 3/4-inches high (if they’re lower, you’ll have some batter leftover). 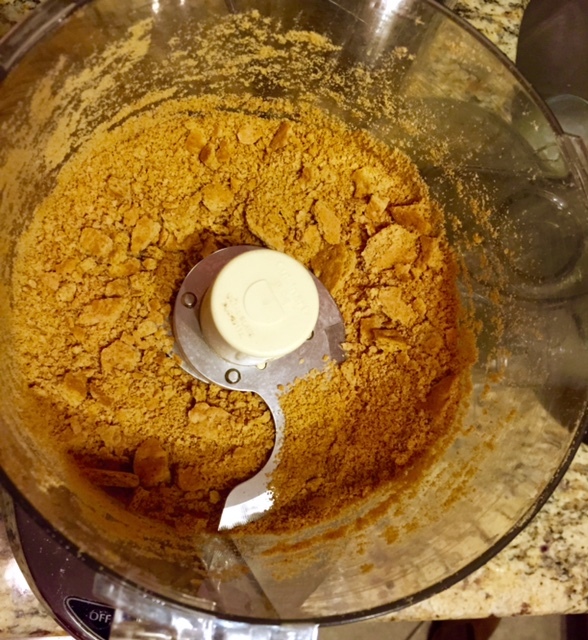 Use a food processor to breakup the graham cracker into crumbs and mix together with the sugar and salt in a medium sized bowl. Pour the melted butter over the mixture and stir with a fork until all of the dry ingredients are uniformly moist. Turn the ingredients into the buttered spring-form pay and pat an even layer of crumbs along the bottom of the pan. You can use the bottom of a drinking glass or measuring cup to flatten out the crust to get a uniform layer. Place the spring-form pan on a baking sheet and bake for 10 minutes. The sides of the crust should be just browning slightly when it’s done. Set the crust aside to cool on a rack while you make the cheesecake. 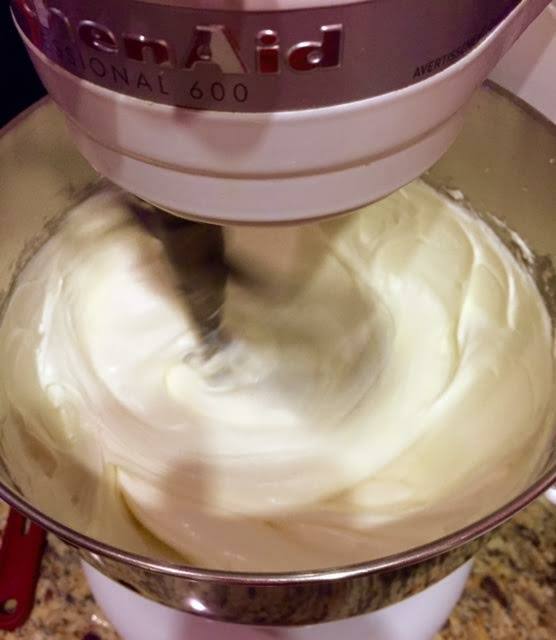 Working with a standing mixer fitted with a paddle attachment, beat the cream cheese at medium speed until it is soft, roughly 4 minutes. With the mixer still running, add the sugar and salt and continue to beat for an additional 4 minutes until the cream cheese is light. You’ll start to see the creamy nature really come through here. Scrape down the sides of the bowl. Beat in the vanilla and add the eggs, one by one, beating for a full minute after each addition — you want a well-aerated batter, but not over-beaten. Scrape down the sides of the bowl. Take the bowl off the mixer and give the batter a few stirs with the rubber spatula, just to make sure nothing has been left unmixed at the bottom of the bowl. Pour the boiling water into a large pot or roasting pan and place it in the oven on the bottom rack. This will regulate the baking temperature since the temperature of water never exceeds boiling point (it turns into steam), it keeps the cheesecake baking at an even, slow temperature. This prevents the cheesecake from overcooking (especially around the edges). the steam created further protects the baking as it keeps the air in the oven moist and humid to prevent the top of the cake from drying out and cracking. Place the spring-form pan on the center rack, just above the pan of water and bake for 1 hour and 30 minutes. Now, no matter how tempted you are, DO NOT OPEN THE OVEN! Any slight change in temperature will cause cracks in the cheesecake or allow it to sink in the middle. Turn off the oven after the 1.5 hours and prop open the oven door for 30 minutes to 1 hour and let the cheese cake cool slowly. You’ll see that the cake is done when the sides are sturdy, but the middle wiggles a little. Whisk the jam until completely smooth and place in a small saucepan. Bring to a simmer over medium-high heat, stirring frequently until the jam is dark and no longer frothy, about 3 minutes. Stir in the lemon juice. To un-mold the cheesecake, wrap a hot kitchen town around the outside of the pan and hold in place for 1 minute. 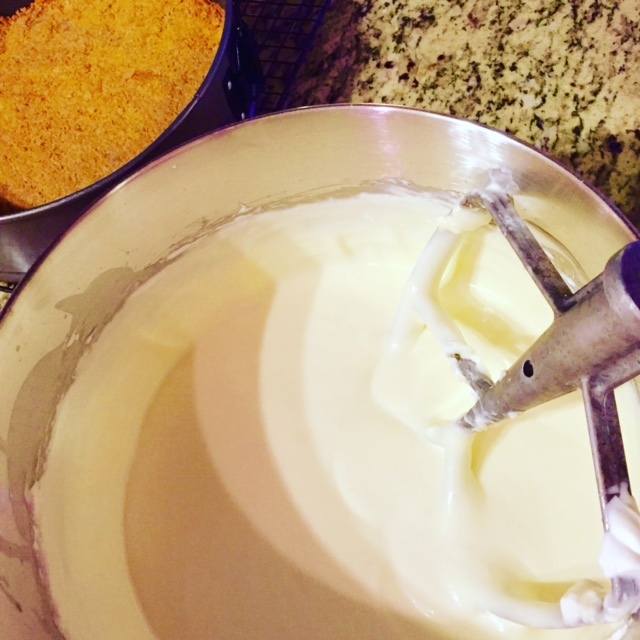 Using a sharp knife, move around the edges of the cake to make sure it is separated from the sides of the pan. Remove the sides and then slide a thin metal spatula between the crust/parchment paper and the bottom of the pan to loosen, then slide the cheesecake onto a serving platter. If you prefer, you can also leave the metal bottom under the cake and place it on the serving plate (for a first time, it’s definitely the safe way to go!). Let the cheesecake sit at room temperature for 30 minutes before serving. 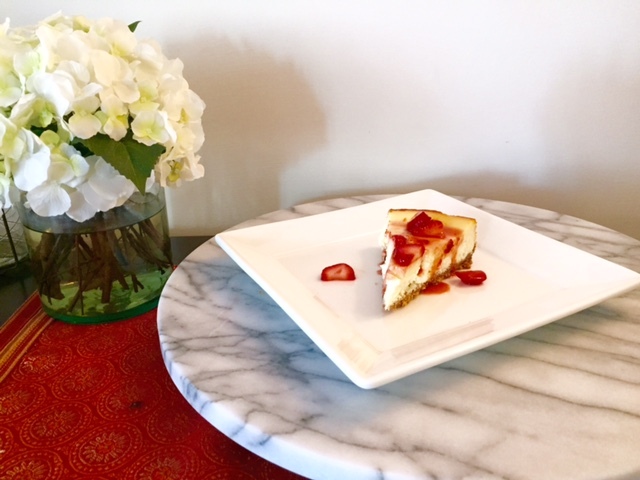 Drizzle the strawberry topping over the slice and drift away in a dreamy, creamy cheesecake!